Therefore, it may consider fucoxanthin has multiple mechanisms to prevent the growth of tumor cell. Several compounds, such as flavonoid Casticin, have a cytotoxic action with multiple mechanisms. However, it is also probable that these multiple mechanisms are divided into a main mechanism and side effects. To identify this, in silico docking study is a powerful tool to do the analysis. Virtual mechanism screening has advantages over in vitro or in vivo analysis within cost and time with the same accurate results. Besides being a useful computational tool in prescreening procedure to identify ligands that have similar biological properties, in silico docking studies can be used for the same ligand to different receptors, in order to identify its side effects. Moreover, in silico studies will also reveal the binding between the targeted ligand to its receptor in three dimensional outlook, to raise understanding on the active site of bioactive compound. Docking calculations were carried out on branded HP PC running windows XP as the operating system, with Intel 3 GHz Core 2 and 1 GB memory hardware. The softwares used for docking preparation were Yasara ver 1.6 and Autodock ver 4.2. Meanwhile, Autodock Vina ver. 1.1 algorithms  were used for binding calculation. Virtual analysis of docking site was used by Autodock Tools ver 1.4 and ArgusLab ver 4.01. The subjected anticancer receptors in this study was p53, CDK2, and tubulin. The structures of those receptors were obtained in pdb files from the protein data bank (www.pdb.org). Each of receptor had been docked with native ligands, a known tumor cytotoxic agents. The receptors code for p53 gene and CDK2 were 1RV1  (with imidazole ligand) and 1AQ1  (with Staurosporine ligand). Meanwhile, the tubulin structure, which has three binding positions in its structure, as shown in [Figure 1], was gained from three different pdb files. The pdb files were 1JFF  (with paclitaxel ligand), 1SA0  (with colchicine ligand) and 1Z2B  (with vinblastine ligand). Meanwhile, fucoxanthin structure file was gained from electronic Marinlit database. In preparation step, hydrogenation and separation of native ligands for each receptor were carried out by using Yasara ver 1.6. Subsequently, Autodock ver 4.2 was used to charge the receptors and ligands and to identify the conformers of targeted ligand (fucoxanthin) and native ligands. Docking of each ligand to the receptors was performed by Autodock Vina ver. 1.1 algorithms. The docking procedure used for rigid receptor and flexible ligand. Binding site in receptors was collected by Autodock Tools Ver. 1.4 automatic identification. The default settings were used for all other parameters. Algorithms validation was conducted by re-docking native ligands to their receptors. The algorithms are valid if the re-docking results have a root square mean deviation (RSMD) less than 2 Å (Angstrom) from original structure. After that, the binding energies of fucoxanthin to each receptor were calculated and compared to those of native ligands. Visualization of the binding site after docking analysis was performed by Autodock Tools ver 1.4 and ArgusLab ver 4.01. Validation of Autodock-Vina algorithms found each of the native ligand conformer had a RMSD value within 1--2 Å to their beginning structures in receptors, as shown in [Table 1]. This means the Autodock-Vina algorithms used in this study were valid. Moreover, [Table 1] also shows binding energies of native ligands and fucoxanthin to each receptor, which it revealed that binding energy of fucoxanthin could only be reached at the same level of colchicine in tubulin receptor. 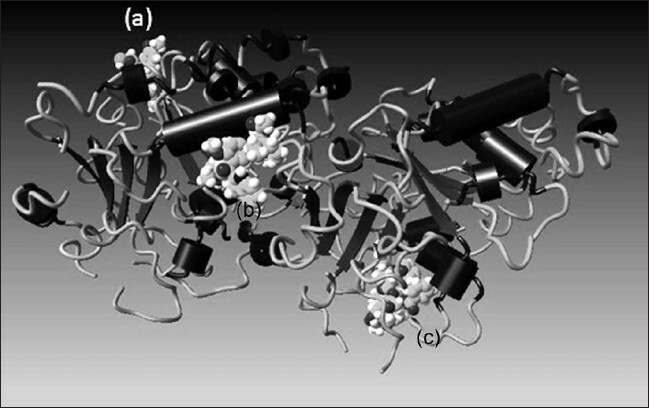 Virtual analysis of binding structure for fucoxanthin bound in tubulin at the colchicine site shown in [Figure 2]. Binding energy is correlated with the probability of affinity and stable bound between ligand and its receptor. , Binding energy value may also predicts the bioactivity value for a ligand to the corresponding receptor. Commonly, receptor gained from the protein data bank already docked with a native ligand, which has a specific binding energy value. If the binding energy value of subjected ligand lower than that of the native ligand, then it may predicts the subjected ligand is very active. Moreover, if the value is the same, it may predicts the activity is in a level with the native ligands. But if it is higher than the binding energy of native ligand, it may consider that the binding between ligand and its receptor is more unstable and the bioactivity underlying the mechanism is lower. Therefore, comparison of binding energies between fucoxanthin and native ligands may predict the main mechanism of fucoxanthin as a tumor cytotoxic agent. As the results showed that binding energy of fucoxanthin to p53 gene was higher than that of the native ligand (imidazole), it is probable the binding present between fucoxanthin and p53 gene is unstable. Although p53 gene activation is a common way to cause tumor cell apoptosis, there are several cytotoxic molecules that act independently to p53 gene activation. The same result was obtained for CDK2 receptor. Therefore, it is also predicted that the probability of stable bound between CDK2 and fucoxanthin is also low. On the other hand, as the binding energy of fucoxanthin was found in the same level of colchicine to tubulin, fucoxanthin may has a stable bound with tubulin at the colchicine site. The binding structure analysis showed the oxygenated site of the cyclohexane ring in fucoxanthin played an important role in this binding mechanism. 1. Hosokawa M, Miyashita T, Nishikawa S, Emi S, Tsukui T, Beppu F, et al. Fucoxanthin regulates adipocytokine mRNA expression in white adipose tissue of diabetic/obese KK-Ay mice. Arch Biochem Biophys 2010;504:17-25. 2. Kotake-Nara E, Asai A, Nagao A. Neoxanthin and fucoxanthin induce apoptosis in PC-3 human prostate cancer cells. Cancer Lett 2005;220:75-84. 3. Kotake-Nara E, Terasaki M, Nagao, A. Characterization of apoptosis induced by fucoxanthin in human promyelocytic leukemia cells. Biosci Biotechnol Biochem 2005;69:224-7. 4. Nakazawa Y, Sashima T, Hosokawa M, Miyashita K. Comparative evaluation of growth inhibitory effect of stereoisomers of fucoxanthin in human cancer cell lines. J Funct Foods 2009;1:88-97. 5. Fajarningsih ND, Nursid M, Wikanta T, dan Marraskuranto E. Bioactivity of Turbinaria deccurens extract as antitumor (HeLa dan T47D) and its effects to lymphocyte proliferation. Indones J Mar Fisheries Prod Process Biotechnol 2008;3:21-7. 6. Ishikawa C, Tafuku S, Kadekaru T, Sawada S, Tomita M, Okudaira T, et al. Antiadult T-cell leukemia effects of brown algae fucoxanthin and its deacetylated product, fucoxanthinol. Int J Cancer 2008;123:2702-12. 7. Kim KN, Heo SJ, Kang SM, Ahn G, Jeon YJ. Fucoxanthin induces apoptosis in human leukemia HL-60 cells through a ROS-mediated Bcl-xL pathway. Toxicol In Vitro 2010;24:1648-54. 8. Liu CL, Huang YS, Hosokawa M, Miyashita K, Hu ML. Inhibition of proliferation of a hepatoma cell line by fucoxanthin in relation to cell cycle arrest and enhanced gap junctional intercellular communication. Chem Biol Interact 2009;182:165-72. 9. Nursid M, Fajaningsih ND, Januar HI, Wikanta T. Apoptosis Induction and p53 Gene expression from Turbinaria deccuens to heLa tumor cells. Indones J Mar Fisheries Prod Process Biotechnol 2007;2:20-4. 10. Das SK, Takasi H, Kazuki K. Growth inhibition of human hepatic carcinoma Hep G2 cells by fucoxanthin is associated with down-regulation of Cyclin-D. Biochem Biophys Acta 2008;4:743-9. 11. Jordan MA, Wilson L. Microtubule as a target for anticancer drugs. Nat Rev 2004;4:253-65. 12. Tuma MC, Malikzay A, Ouyang X, Surguladze D, Fleming J, Mitelman S, et al. Antitumor activity of IMC-038525, a novel oral tubulin polymerization inhibitor. Transl Oncol 2010;3:318-25. 13. Villanueva HE, Setzer WN. Cembrene diterpenoids: Conformational studies and molecular docking to tubulin. Rec Nat Prod 2010;4:115-23. 14. Haïdara K, Zamir L, Shi QW, Batist G. The flavonoid casticin has multiple mechanisms of tumor cytotoxicity action. Cancer Lett 2006;242:180-90. 15. Nagal A, Jangir OP, Solanki PS, Sigh V, Krishanohan M. In silico and in vivo study of lens regeneration under influence retinoid. J Proteomics Bioinf 2008;1:104-8. 16. Brooijmans N. Docking Methods, Ligand Design, and Validating Data Sets in the Structural Genomic Era. In: Gu J, Bourne PE, editors. Structural Bioinformatics. United States: John Wiley and Sons Inc; 2009. p. 635-63. 17. Trott O, Olson AJ. AutoDock vina: Improving the speed and accuracy of docking with a new scoring function, efficient optimization and multithreading. J Comput Chem 2010;31:455-61. 18. Vassilev LT, Vu BT, Graves B, Carvajal D, Podlaski F, Filipovic Z, et al. In vivo activation of the p53 pathway by small molecule antagonists of MDM2. Science 2004;303:844-8. 19. Lawrie AM, Noble ME, Tunnah P, Brown NR, Johnson IN, Endicott JA. Protein kinase inhibition by staurosporin revealed in details of the molecular interaction with CDK 2. Nat Struct Biol 1997;4:796-801. 20. Lowe J, Li H, Downing KH, Nogales E. Refined structure of alpha beta tubulin at 3.5 A resolution. J Mol Biol 2001;313:1045-57. 21. Ravelli RB, Gigant B, Curmi PA, Jourdain I, Lachkar S, Sobel A, et al. Insight into tubulin regulation from a complex with colnicine and a stathmin-like domain. Nature 2004;428:198-202. 22. Gigant B, Wang C, Ravelli RB, Roussi F, Steinmetz MO, Curmi PA, et al. Structural basis for the regulation of tubulin by vinblastin. Nature 2005;435:519-22. 23. Munro MHG, Blunt JW. MarinLit - Marine Literature Database, Version 13.5. Marine Chemistry Group, Department of Chemistry-University of Canterbury. Christchurch, New Zealand; 2007. 24. Hetch D, Fogel GB. A novel in silico approach to drug discovery via computational intellegence. J Chem Info Model 2009;8:10-21. 25. Haryadi W, Jenie UA, Sudibyo RS, Pranowo HD, Wibowo FR. Molecular docking of anydroerythromycin to r-RNA 23S Deinococcus radiodurans and the prediction of its antibiotic potency. Indones J Chem 2009;9:303-7. 26. Istyastono EP. Docking studies of curcumin as a potential lead compound to develop novel dipeptydyl peptidase-4 inhibitors. Indones J Chem 2009;9:123-6. 27. Kartasasmita RE, Herowati R, Harmastuti N, Gusdinar T. Quercetion derivatives docking based on study of flavonoids interaction to cyctooxygenase-2. Indones J Chem 2009;9:297-302. 28. Prakash N, Patel S, Faldu NJ, Ranjan R, Sudheer DV. Molecular docking studies of antimalarial drugs for malaria. J Comput Sci Syst Biol 2010;3:70-3. 29. Shankaracharya, Priyamvada, Vidyarthi AS. 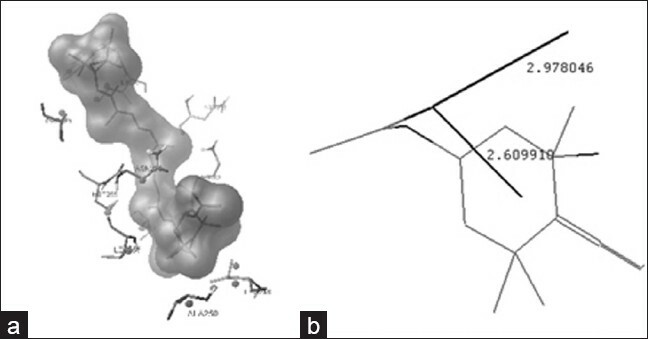 in silico prediction of D-HSCDK2 structure and its docking study with plavopiridiol analogues. J Chem Pharm Res 2010;2:329-37. 30. Sa G, Das T. Anti cancer effects of curcumin: Cycle of life and death. Cell Div 2008;3:14. 31. Okuzumi J, Nishino H, Murakoshi M, Iwashima A, Tanaka Y, Yamane T, et al. Inhibitory effects of fucoxanthin, a natural carotenoid, on N-myc expression and cell cycle progression in human malignant tumor cells. Cancer Lett 1990;55:75-81. 32. Blajeski AL, Phan VA, Kottke TJ Kaufmann SH. G1 and G2 cell-cycle arrest following microtubule depolymerization in human breast cancer cells. J Clin Invest 2002;110:91-9. 33. Mooberry SL, Weiderhold KN, Dakshanamurthy S, Hamel E, Banner EJ, Kharlamova A, et al. Identification and characterization of a new tubulin-binding. Tetrasubstituted brominated pyrrole. Mol Pharmacol 2007;72:132-40. 34. Carre' M, Andre' N, Carles G, Borghi H, Brichese L, Briand C, et al. Tubulin is an inherent component of mitochondrial membranes that interacts with the voltage-dependent anion channel. J Biol Chem 2002;277:33664-9. Wang, J. and Chen, S. and Xu, S. and Yu, X. and Ma, D. and Hu, X. and Cao, X.